This is a rather chinese looking dress I'm gonna wear for my friend's wedding dinner banquet! 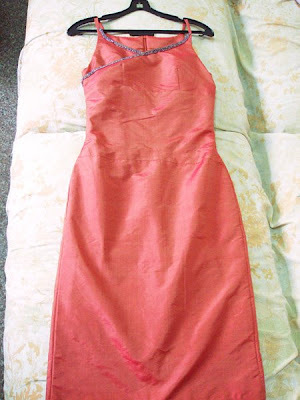 Rust red Thai silk with glass beads, fully lined, the neckline is an overlap wrap and ends somewhere around mid-torso. The strap is bias-cut. It took me 5 days non-stop to sew this because I had to juggle errands too so I'm glad it's over. My lessons for the period: Invest in an invisble zipper foot for my domestic machine! The handstitching of the invisible zip took way too long - 4 hours- and it's not fun to sew when the weather has been extremely hot and humid even at night. Beading took 6 hours. And Murphy's Law answers, just as I'm complaining the weather is too hot, it's pouring now =/ and I need the sunny weather to take photos of my vintage jewellery that just arrived... does that ever annoy you?! 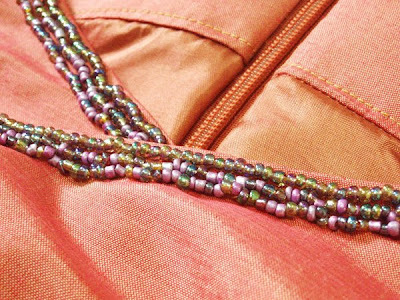 This is gorgeous, I just love the colour of this fabric, it looks like its a tone of gold and orange/red, the beads make really add to it. It looks like its shop bought you've done that much of a great job on it :). Have you thought about setting an etsy shop of premade clothes? groovey- yes it's sort of a 2-tone fabric of red and brown. It was too plain and so I beaded it ;) and nope dressmaking is too much of a pain for me to devote all my energies on, i really admire people who tailor for a living! You are so talented! The dress is amazing! !